Get Advice and Compare Bicycle Seats to Find Which is Best for You. For spinning classes, try the Lycra wide or medium covers. If you want to put your own seat, or get one you have already tried, get an adapter and use any bike seat you want on your exercise bike. If you bike seat is old and tired, try the Lycra padded seat covers. Want a new narrow high tech seat? Give us a call and we can order almost anything you need. Contact Us. Specializing in prostate pain and numbness - for men after prostate surgery and with prostatitis. These seats help keep blood flow moving. Noseless & Hornless bicycle seats, vented, deep relief & grooved bicycle seats too. 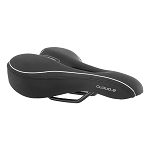 Bicycle Seats For Men - or anyone (men or women) with pain and groin numbness issues.